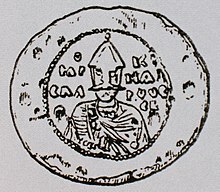 Yaroslav I, Grand Prince of Rus', known as Yaroslav the Wise (c. 978 – February 20, 1054) was Grand Prince of Novgorod and Kiev. He brought together the two principalities for a time under his rule. A son of the Varangian (Viking) Grand Prince Vladimir the Great, he was vice-regent of Novgorod at the time of his father’s death in 1015. His oldest surviving brother, Svyatopolk the Accursed, killed three of his other brothers and took power in Kiev. Yaroslav, with the support of the Novgorodians and the help of Varangian mercenaries, defeated Svyatopolk. He became the Grand Prince of Kiev in 1019. Yaroslav started to write down the legal customs. This served as the basis for a law code called the Russkaya Pravda ("Russian Justice"). During his long reign, Rus' reached the height of its cultural flowering and military power. ↑ Hynes, Mary Ellen (1993). Companion to the Calendar: A Guide to the Saints and Mysteries of the Christian Calendar. LiturgyTrainingPublications. p. 105. ISBN 978-1-56854-011-5. ↑ National Geographic. National Geographic Society. 1985. ↑ 3.0 3.1 "Yaroslav I (prince of Kiev) - Britannica Online Encyclopedia". Britannica.com. Retrieved 2012-04-07. This page was last changed on 13 September 2018, at 03:04.